On the day of return from Paris to Japan, I entered a café after I finished packing in my hotel room. The café is located right in front of the hotel, and as I opened the door, I heard a bright “bonjour monsieur” from the mistress of the café. For me, Paris became close when I was able to reply to that by saying “bonjour madam” without any hesitation. I took a seat near the counter. “Un café s’il vous plait (one cup of coffee please).” I got used to ordering in French after memorizing phrases written on the guide book I had. Café after nine o’clock in the morning seems to be the time where the so called breakfast rush ends. A quiet time seems to flow into the shop, and when I look around inside, I realized that there is only a single man other than myself. This seems to show a different expression of the café, considering the fact that it is crowded with people from evening to night time. The man I saw is staring at a single point on the wall and drinking coffee. The serious expression on his face makes me wonder what he’s thinking and whether he’s staying here prior to work. Under this quiet atmosphere, all you can hear is the sizzling sound made by the espresso machine. In a while, a coffee I ordered is set on my table. I looked out the window to see the people walking in the city, and reflected upon my days in Paris. 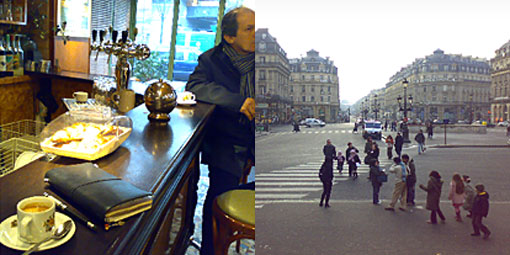 When you walk in the city of Paris, you can spot a lot of café. For travelers, café is not only a place to take a rest, but also a place where it provides a space to stay in the city. The long history of the café in Paris has accepted various foreigners. The French poet Arthur Rimbaud was one of those foreigners who visited a café in Paris, and departed to a new place as a traveler. Café back then was a place where artists and thinkers would gather to present their works and opinions, and have a debate on it. Rimbaud immersed himself into this environment and made a debut in the world of literature. Although he put himself in the dynamic culture of the café in Paris, he ended up not staying there and wandered about Europe and Africa. Rimbaud spent his life as a traveler, and in the end, became ill in Halal, Ethiopia and was transferred to a hospital in Marseille. There, he ended his life in the age of 37. His way of living not only makes us think about his poem, but also about the meaning of traveling. It’s actually a nice time thinking about the dramas that happened in the antique cafés located in Paris.